Osteoarthritis is a progressive degeneration of joint cartilage that affects 1 in 10 men and nearly 2 out of 10 women over the age of 60 worldwide. Unlike rheumatoid and psoriatic arthritis, osteoarthritis does not appear to be an autoimmune condition. In a healthy joint the cartilage cells are constantly dying and being replaced. How long each cartilage cell (called a chondrocyte) lives before it is replaced is not yet known,. For reason’s not entirely understood (whoever does figure it out will be a billionaire) in a joint with osteoarthritis the destruction outpaces the creation. The resultant joint swelling causes joint capsule stiffness and abnormal forces which stimulate the growth of bony osteophytes that further restrict movement. What Environmental Factors Cause Osteoarthritis? -The data were too heterogeneous to be pooled but nearly all studies showed an increase in hip and knee osteoarthritis with increasing body mass index. Most of these studies used the World Health Organization classification of overweight as a BMI >25 and Obese as >30. -This association was weaker. The data were too heterogeneous to be pooled but most odds ratios were in the area of 1.1 to 1.4. -Amin et al examined the cartilage under their kneecaps of 192 males and found that it was more likely to be arthritic if they had been exposed to heavy lifting. -Lau et al found higher levels of hip osteoarthritis in men who reported climbing stairs often for work but no increase in women who reported climbing stairs often. 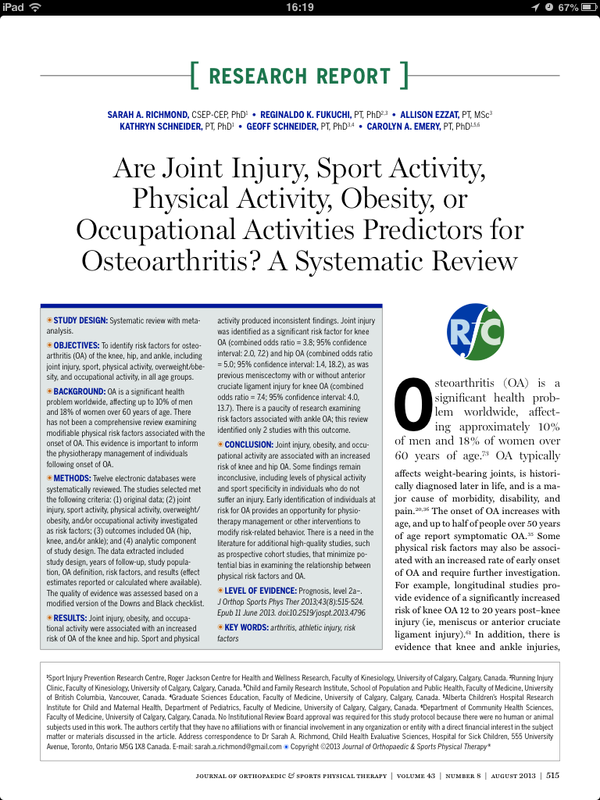 The questions of physical activity and sports participation as risk factors for osteoarthritis is unclear. About 2/3 of the studies on sports participation showed that it increased risk of knee and hip arthritis but about a third showed it either decreased risk or had no increase in risk of osteoarthritis. Some of these studies controlled for joint injury and others did not. In the studies reviewed, physical activity was found either to reduce risk of osteoarthritis or have no affect on risk. At this point the strongest risk factors for knee and hip osteoarthritis are still mostly out of our control: joint injury. For myself, I plan on engaging in physical activities that have lower risk of joint injury: ie acroyoga instead of basketball. I don’t recommend spending your entire life doing a job that requires heavy repetitive lifting and stair climbing although I would speculate that these activities can be done in joint sparing ways. Since physical activity has many known health benefits and inconclusive connections to osteoarthritis I plan to be as active as possible. The relationship between BMI and osteoarthritis suggests that body weight, regardless of whether it is fat or muscle is a risk factor for osteoarthritis. If you are a big muscular person (BMI >25) who is really concerned about osteoarthritis you should consider letting some of that muscle go. What about the genetic risk factors? This is a topic I am still researching and will write a post when I have found some high quality science.